Wide Asleep in America: The Propaganda Train Keeps A'Rollin'... Next Stop: Indoctrination Station! It appears that a massive offensive is underway, though not in the way one might expect from the Israeli state. This time, the new bombshells spill out of Public Relations offices and spew forth from the tainted mouths of guilty and corrupted statesmen, rather than F-16s. With a little more than one month to go until Israel celebrates its 60th Anniversary of ethnic cleansing and land theft, much groundwork is being laid in order for the world to unconditionally support the racist state for at least another six decades. 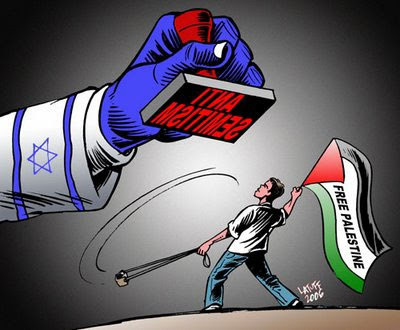 In its recent PR blitz, it seems that a strategy of "winning over" critics of Israel has momentarily usurped the role of constant charges of anti-semitism levied against anyone who dare question the nobility, honor, and God-given right of the supposed Jewish state. Cecilie Surasky of MuzzleWatch, reporting on an article found on Ynet, states that "as part of the Israeli Foreign Affairs Ministry’s efforts to bring over prominent US writers, US-based group Solomon Project is providing prominent left wing bloggers and progressive leaders like Tom Matzzie (formerly of MoveOn) and Daily Kos editor David Waldman all-expenses paid trips to Israel. They’ll land Thursday for a six-day tour." It remains to be seen whether the bloggers will also be told about the anti-government protests by residents of Sderot, many of them originally from Arab and Muslim countries, who have been furious at the government for leaving them vulnerable and defenseless to these attacks. And while they will get a meeting with Palestinian negotiator Saeb Erekat, it’s equally unlikely that the bloggers will meet with Palestinian human rights groups in Gaza that could give them a complete tour of the massive destruction of homes, infrastructure and economy; the deliberate slow starvation; and the killing of thousands, that is the terrible story of Israeli intervention in the past and through today. Can one free trip really make anyone buy that perverse logic? Does this mean that Israel and its powerful supporters and apologists across the world will cease its relentless attacks on academic freedom, both here in the United States and abroad? No way. Will the absurd charges of "self-hating" status for dissenting Jews and anti-semitism against all the rest finally stop so that an actual discourse can prevail? Of course not. If these types of meetings do not contribute to that effort, or worse, if they fuel the tensions that impede constructive engagement, then we need to ask ourselves whether the public format of debates in New York truly help create the environment necessary to facilitate the pursuit of the two-state solution. Meanwhile, the UN General Assembly constantly passes resolutions condemning Israeli aggression against Palestinians and other Arab neighbors and annually votes in favor of ending the Israeli occupation of the Palestinian Territories. The international community is not fooled by Israel's empty gestures towards peace, despite the constant claims of Israel's close economic and ideological ties with the US and EU. A recent report on the Israeli-Palestinian conflict, commissioned by the UN Human Rights Council and conducted by South African law professor Prof. John Dugard, states that Palestinian violence against Israel is to be expected based on their past and current oppression and that the Apartheid regime in place in the Occupied Palestinian Territories is worse than what was experienced in South Africa. As reported by Israeli newspaper of record Ha'aretz, "Dugard, a South African lawyer who campaigned against apartheid in the 1980s, says 'common sense ... dictates that a distinction must be drawn between acts of mindless terror, such as acts committed by Al-Qaida, and acts committed in the course of a war of national liberation against colonialism, apartheid or military occupation.'" "While Palestinian terrorist acts are to be deplored, they must be understood as being a painful but inevitable consequence of colonialism, apartheid or occupation," writes Dugard, whose 25-page report accuses the Israel of acts and policies consistent with all three. He cited checkpoints and roadblocks restricting Palestinian movement to house demolitions and what he terms the Judaization of Jerusalem. "As long as there is occupation, there will be terrorism," he argues. The "slamming" of such critics of Israeli policy is to be expected. Any report, article, speech, or stance that challenges the belief that Israel is a glorious and just nation that values democracy, human rights, and civil liberties is deemed discriminatory by the Israeli government. Apparently, illegal settlements, Jews-only roads, an Apartheid wall, the deliberately deadly denial of medical treatment for Gaza patients, the systematic psychological destruction of Palestinian children, and the refusal to accept ceasefire offers from the elected Palestinian leadership aren't cause for critique or concern. I suppose nothing should be said or known about a 12-year-old Palestinian girl named Safa Abu Saif who was shot in the chest by an Israeli sniper while she was inside her own home in Jabaliya, northern Gaza, in early March 2008. When an ambulance came to help her, Israeli soldiers open fire at it, wounding a paramedic and blowing out three of its tires. Even with no help on the way, "the ambulance center told the family to evacuate the girl. Her mother Samar carried Safa but as soon as she left the house, the Israeli soldiers opened fire at her and the wounded girl fell to the ground. Samar dragged her into the house." As the 12-year-old girl was bleeding to death, "Israeli forces cut the electricity and shot the water tanks on the roof." Safa died three hours later. But, I guess these actions are to be expected of any upstanding, judicious, and moral occupying army. Professor Falk (who, incidentally, is Jewish) said he drew the comparison between the treatment of Palestinians with the Nazi record of collective atrocity, because of what he described as the massive Israeli punishment directed at the entire population of Gaza. He said he understood that it was a provocative thing to say, but at the time, last summer, he had wanted to shake the American public from its torpor. “If this kind of situation had existed for instance in the manner in which China was dealing with Tibet or the Sudanese government was dealing with Darfur, I think there would be no reluctance to make that comparison,” he said. That reluctance was, he argued, based on the particular historical sensitivity of the Jewish people, and Israel’s ability to avoid having their policies held up to international law and morality. Indeed, with so much action being taken against the Olympic Torch these days due to China's treatment of Tibetan protesters, questions remain about why Palestinian oppression isn't addressed as well in a forum as public and daunting as the Golden Gate Bridge. Recently, two European leaders have shown their unconditional support for Israel and have done their very best to blithely ignore the painful realities of Palestinian discrimination, oppression, and occupation. German Chancellor Andrea Merkel and Polish Prime Minister Donald Tusk have both decided to play the role of toadie to Israel's schoolyard bully. In this situation, stemming mostly from a sense of extreme European guilt over the tragedies of the 1930's and 40's (with maybe a pinch of modern imperial corruption thrown in for flavor), Merkel and Tusk appear to be competing for best friend status, sucking up to the great and powerful Israel in order to rid themselves of the shame of historical genocide. The chancellor said that Israel has been fighting for 60 years against threats and for peace and security, with the values of freedom, democracy, and human dignity. Is that so? Then why are Jewish intellectuals inside and outside Israel--Holocaust survivors among them--vehemently and increasingly deploring the moral decay, militarization of the society, and the self-destructive policy of the country? Chancellor Merkel's speech, in short, is a compendium of banalities, lies, omissions, threats, and sycophantic bunkum. Yet it earned her a standing ovation in the Knesset, and its reception in Germany has been little short of ecstatic. Here, for example, is Thorsten Schmitz in the respected Sueddeutsche Zeitung: "Israel wouldn't exist without the Germans. The state of the Jews is the answer to the Holocaust ... Every further year that Israel exists is ... metaphorically speaking a victory over Hitler ... Angela Merkel did not wish to take her place in the line of well-wishers [on Israel's 60th birthday], but wished to lead it." Once again, we find the poisonous blend of historical half-truth -- the move towards establishing a Jewish state in Palestine began decades before the Holocaust, although the latter undoubtedly hastened its establishment -- with silence about the crimes attendant upon the foundation of that state, its maintenance and its inexorable expansion. The PR push to legitimize the state of Israel as a beacon of hope for the oppressed, and as the result of inspired determination and hard work on the part of a disadvantaged, demonized, and dispossessed people, bizarrely twists the historical narrative into a surreal mirage of false nobility coupled with perverse and reversed logic and irony. Merkel's lack of either awareness or care for the realities of the Palestinian situation reveals the extent to which shame can so fully cloud judgment, eliminate human decency, sideline objectivity, and sustain an environment wherein the supposed descendants of victims of German history are granted eternal license, liberty, impunity, immunity, and absolution without even a hint of responsibility or condemnation. Having expressed Germans' "shame" for the Holocaust, she goes on to point out that "while we are speaking here, thousands of people are living in fear and terror of Hamas's rocket-attacks and terrorism." Her clumsy choice of words seems to emphasize the failure to mention the hundreds of thousands of Palestinians who are living in daily fear and terror of Israeli incursions, home demolitions, assassinations, air-strikes, arbitrary arrest, imprisonment and torture. However, in fairness, she does in fact mention the Palestinians: "Terror attacks ... bring no solutions to the conflict that overshadows the region and the daily lives of people in Israel and the lives of people in the areas of Palestinian self-rule." So it is in fact not Israel's colonization, wall-construction, and violent militarism that are overshadowing the lives of Palestinians, but the actions of Hamas. Note that these Palestinians don't live in "occupied" or even "disputed" territories, but in "areas of self-rule" (autonomiegebieten), which sounds much more innocuous. This term, which was in universal use in the early days of the Oslo process, is now only used by the Germans as it conceals the uncomfortable fact that the Palestinians live under a cruel EU-backed occupation. "Germany firmly supports the vision of two states in peace and within secure borders, for the Jewish people in Israel and the Palestinians in Palestine," Merkel said. Regrettably she never misses an opportunity to proffer a thumping cliche, and her proneness to "visions" is uncomfortably reminiscent of the current US president. Her wording here seems to endorse ethnic nationalism and perhaps even ethnic cleansing, since she implies that Israel's Palestinian citizens should find a home within the hypothetical "Palestinian state." We are still confronted with the phenomenon that critics of the Jewish State are labeled as anti-Semites or as self-hating Jews, respectively. Historian Ilan Pappe, for instance, in his current bestseller "The Ethnic Cleansing of Palestine" provided evidence that the foundation of Israel was accompanied by crimes against humanity. A great part of the indigenous population had been brutally expelled--some were murdered -, hundreds of villages were destroyed and estates were disseized. What kind of peace can you reach by ignoring facts like these? What kind of peace can you seek when ignoring the decade-long occupation of the West Bank and the Gaza Strip? And the annexation of a part of Syria? What kind of peace can one hope for when a wall is built not on the border, but on the land of the neighbor? When settlements are placed in occupied territory and expanded until today against international law? When water reservoirs are being tapped that do not lie on the own state territory? When populations are harassed and treated with violence because of their ethnic affiliation? When democratic elections of the neighbor are annulled which arouses a civil war? But obviously "facts" are not friendly to the unconditional support of the Israeli state. Zionism has always relied on promulgated mythology to thrive and survive and Merkel surely plays along for fear of being seens as anything but a staunch supporter of Israel. "Unfortunately, in big politics it is not the facts that count, but myths," writes Hamadeh. Israel and the Jews allegedly are victims of history until today, this is what every child in Israel learns in school. "Although the Federal Republic of Germany has always stood with Israel and its right of existence, the German public has often lacked an engagement and empathy for the state that was wrenched from the desert and a hostile anti-Western environment. Polls show time and time again that many Germans have a lot of understanding for the Palestinians and their problems--while remaining on a most critical distance to Israel, regarding Israeli heroism of survival to rather be an aggressive basic attitude", wrote the editor-in-chief of the daily newspaper Die Welt, Thomas Schmid, on March 16, 2008, sentimentally in a contribution for page 1. When Israel's violence is praised to be heroic, it is no wonder that there is no change. The myth of Israel the victim, the myth of the Six-Day war, the myth of Oslo, the myth of anti-Semitic Islam/Arabia, they are all refuted and still form the basis of Western policy. It is perfidious that Israel claims to speak and act for all Jews. To perform breaches of human rights and of international law explicitly in the name of the Jews--this inevitably leads to the creation of anti-Jewish tendencies. This is a major problem. It would be an anti-Semitic clichè, so we hear, that the Jews are themselves responsible for Judaephobia. Yet the discussion does not end here. If things are so straightforward, why then does Israel act against its own interests? From the beginning, the Israeli society has been traumatized with the Nazi genocide against the Jews. It is in the nature of the trauma that the unmastered situation is played through and unconsciously provoked over and over again, to the end of understanding what had happened in Germany and Europe. This is the reason why Palestinian, Arab and Muslim leaders have constantly been conceptualized as Hitler's revenants: Arafat, Sheikh Yasin, Saddam, Ahmadinejad etc. The brutal measures against the civil population also is to be understood in terms of the trauma: it is a truism that victims can easily turn to perpetrators when not overcoming their trauma. This certainly is also true for Palestinians. There is another reason for Israel to remain in its trauma: the Zionist ideology needs anti-Semitism as a legitimation. It is the linchpin of Israeli policy, Likud's and Labor's alike. Without the "existential threat", be it real or propaganda, the Israeli identity breaks down, at least as long as it is Zionist. Nazi Germany also spoke of an existential threat and demographic ticking timebomb. Germany's 20th-Century atrocities were severe and the sorrow and shame that Germans feel (and that their leaders embody) is real and should not be trivialized. However, the way to make up for a nightmarish and offensive past is not by promoting a terrible future; a future in which the victims and innocents of the past are the oppressors and aggressors of today. "A penance is being paid for Germany's past crimes," Raymond Deane states. "And it is being paid by the Palestinians to whose plight Merkel is so indifferent." There is a name for someone who bears another person's sins: a scapegoat. And there is one European state that has a dark history of scapegoating a Semitic people for its own failings: Germany. For this reason, those who believe that Germany's policy towards Israel in some way redeems it are seriously deceiving themselves. By scapegoating the victims of its former victims, Germany is compounding its past crimes. If the Holocaust has imposed a historical obligation upon Germany, then it is in large measure towards the Jewish people. Germany, however, has chosen to interpret this obligation as entailing unconditional support for the State of Israel, a state that did not exist at the time of the Holocaust, thus implicitly or explicitly affirming that state's disputed claim to represent Jewish people everywhere. Germany thereby cuts the ground from under all Jews throughout the world -- including within Israel -- who bravely dissociate themselves from the crimes of the Jewish state. In an equal attempt to shed the guilt of association, Polish Prime Minister Donald Tusk has recently done his damnedest to show his love for Israel. Tusk, whose grandfather was forced to serve in Hilter's army (the Wehrmacht) during World War II, stressed the deep connection between, not only Poles and Jews, but also between Poland and Israel - a country that didn't even exist until three years after the end of the Second World War. Tusk stated last week that "the relationship between Poland and the Jews is centuries old. Poland was the homeland of various peoples, including the Jews. There is no Polish culture without Jewish culture. We want Israelis, especially the young, to experience this side." Tusk does not sound disingenuous in his desire to have Jews associate Poland with something other than the Holocaust and Auschwitz, but what is striking is the implicit connection between European Jewry, the actual victims of Hitler's ethnic cleansing, and the Israeli youths of today - the same youths that must serve in the Israeli military, many of whom serve to dehumanize, humiliate, and violently oppress Palestinians. Tusk's motives are quite clear. On Wednesday, during his first ever visit to Israel, Tusk made it clear, as Ha'aretz reported, "that Poland stands alongside Israel on the issue of the threat posed by Iran, maintaining that Poland 'has no doubt that Iran's words toward Israel cancels its right to a place in the international community.'" Tusk emphasized his country's alliance with Israel with regard to Iran, saying that "if there are exceptions in Europe with regard to the Iran issue, it is definitely not Poland," speaking at a joint press conference with Prime Minister Ehud Olmert in Jerusalem. So there it is. Any state that is implicated in the horrific history of 1930's and 40's Europe must stand with Israel regardless of what's right and wrong, regardless of the absurd propaganda that pours out of bellicose heads of state and their corrupt media. If Germany and Poland were to defend the legal right of Iran to seek civilian nuclear energy and publically disagree with the US/Israel anti-Iranian rhetoric and aggressive threats, they would be accused of complacency and complicity on par with Neville Chamberlain. They will do anything to avoid being accused of anti-semitism and as a result gladly relinquish all respect for basic human rights and international law. French President Nicolas Sarkozy recently made his own commitment to keeping the Holocaust alive in the minds of young people. Speaking to members of the Jewish community, he vowed to ensure every 10-year-old learned the personal story of a French Holocaust victim in the same age group. He has also urged children to think of the Holocaust when standing to the French national anthem. The policies of Messrs. Brown and Sarkozy may be driven by pure sentiments. The slavery, starvation and gassing of millions of Jews by the Nazis should, indeed, be remembered by future generations, which will, hopefully, learn lessons about man’s inhumanity to man. And, indeed, there is little danger of that as long as there are Holocaust memorials, Holocaust museums and libraries as well as thousands of movies, documentaries and books on the subject. On the other hand, one can’t help but fear their motives are political. Israel came into being after the Holocaust and even today it cites the Holocaust as its raison d’être as a Jewish state. “Never again” is its watchword, and, by and large, Westerners are sympathetic to its survivalist stance fueled by their own knowledge of the atrocities committed during the Holocaust and sometimes by a collective sense of guilt. This translates to Israel being treated as a special case within the community of nations. It alone can get away with a covert nuclear weapons program, the flouting of dozens of UN resolutions, unprovoked attacks on its neighbors and continued occupation of another people’s land, which flies against international and humanitarian laws. When coming under verbal attack from whatever quarter, the Israeli government wraps itself in the Holocaust and flourishes the anti-Semite card even when criticisms are justified. In this way protagonists are silenced and promising careers cut short. By using the Holocaust as a political and economic tool to silence critics of Israel, European leaders reveal their true allegiance to US and Western hegemony and imperialism in the Middle East, and subsequently across the globe. By placing Jews on a higher moral plateau, with an equally greater level of tragedy, than the rest of the world, we see a sort of neo-racism and brain-washing beginning to spread throughout the US and Europe. If the Jews had it worse than anyone ever before, then Israelis must be saved from a similar fate! this new ideology seems to cry. But by elevating the past suffering of Jews to unsurmountable heights and immeasurable proportions, to the irrelevance of everyone else's problems, European leaders have turned victimization around on itself and allowed the tragedies of the past to trump those of the present for fear of being called names. In fact, Israel acts like so many children of drunk and abusive parents, passing victimization and trauma down through the generations. The victim turns abuser, all the while bemoaning his/her tragic past and using it as a bludgeon against any and all criticism. The same thing happened to us, only worse! they cry. But Jews are not unique to suffering. No one group, culture, religion, sect, community, nation, or race has a monopoly on agony. The history of the planet is punctuated with crimes against humanity, genocide and massive casualties of war. The near obliteration of Native Americans, the 800,000 Armenians massacred during World War I, the nuclear devastation of Hiroshima and Nagasaki, and the 27 million Russian victims of World War II are just a few examples. Let’s not forget Deir Yassin, Sabra and Shatila or the war of attrition that Israel is currently waging against Gaza. And let’s not forget the million plus Iraqis who lost their lives as a result of the 2003 US-led invasion. Let’s remember too the 800,000 Rwandans killed in the space of only 100 days as the world watched. The list is endless. If Europe’s school kids are to be taught about the Holocaust, encouraged to visit the death camps and to mentally “adopt” a dead child, then they should surely also be told about other atrocities. And even more importantly, they should be enlightened as to the suffering happening now -- not 50 or 100 years ago, but here and now. I do not seek to diminish the Holocaust or the suffering of its victims and their families. In fact, I freely admit that I have shed tears on occasion after reading a book or viewing a documentary about this disgusting period in European history. But others have suffered, too, and their pain is just as real and authentic. In short, there should be balance in schools. British and French children should be familiarized with the Holocaust as part of a broader discipline covering genocide and war crimes. Else those countries risk being accused of indoctrinating their young in favor of the Jewish state as a deceptive political strategy rather than an honorable humanitarian goal. As a 10-year-old growing up in Johannesburg, I celebrated Israel's birth, 60 years ago. I unquestionably accepted the dramatic accounts of so-called self-defensive actions against Arab violence, to secure the Jewish state. 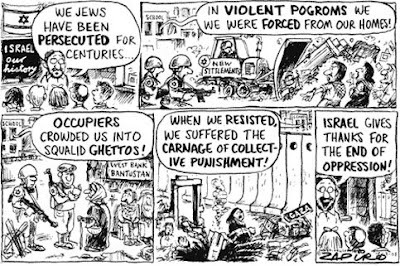 The type of indoctrination South African cartoonist Zapiro so bitingly exposes in his work, raising the hackles of scribes such as David Saks of the South African Jewish Board of Deputies. When I became involved in our liberation struggle, I became aware of the similarities with the Palestinian cause in the dispossession of land and birthright by expansionist settler occupation. I came to see that the racial and colonial character of the two conflicts provided greater comparisons than with any other struggle. When Nelson Mandela stated that we know as South Africans "that our freedom is incomplete without the freedom of the Palestinians,"  he was not simply talking to our Muslim community, who can be expected to directly empathize, but to all South Africans precisely because of our experience of racial and colonial subjugation, and because we well understand the value of international solidarity. When I came to learn of the fate that befell the Palestinians, I was shaken to the core and most particularly when I read eye-witness accounts of a massacre of Palestinian villagers that occurred a month before Israel's unilateral declaration of independence. This was at Deir Yassin, a quiet village just outside Jerusalem, which had the misfortune to lie by the road from Tel Aviv. On 9 April 1948, 254 men, women and children were butchered there by Zionist forces to secure the road. Because this was one of the few such episodes that received media attention in the West, the Zionist leadership did not deny it, but sought to label it an aberration by extremists. In fact, however, the atrocity was part of a broader plan designed by the Zionist High Command, led by Ben Gurion himself, which was aimed at the ethnic cleansing of Palestinians from the British mandate territory and the seizure of as much land as possible for the intended Jewish state. "The gang ... were young ... men and women, armed to the teeth ... and [had] also cutlasses in their hands, most of them still blood-stained. A beautiful young girl, with criminal eyes, showed me hers still dripping with blood; she displayed it like a trophy. This was the 'cleaning up' team, that was obviously performing its task very conscientiously." As Israel's first minister of agriculture, Aharon Cizling, stated in a 17 November 1948 Cabinet meeting: "I often disagree when the term Nazi was applied to the British ... even though the British committed Nazi crimes. But now Jews too have behaved like Nazis and my entire being is shaken." Despite these sentiments, Cizling agreed that the crimes should be hidden, creating a lasting precedent. That such barbarism was conducted by Jewish people a mere three years after the Holocaust must have been too ghastly to contemplate, as it would constitute a major embarrassment for the state of Israel, held-up as a "light unto nations;" hence the attempts to bury the truth behind a veil of secrecy and disinformation. What better way to silence enquiry than the all-encompassing alibi of Israel's right of self-defense, condoning the use of disproportionate force and collective punishment against any act of resistance. Precisely because Israel was allowed to get away with such crimes, it continued on its bloody path. According to Ilan Pappe, "Fifteen minutes by car from Tel-Aviv University lies the village of Kfar Qassim where, on 29 October 1956, Israeli troops massacred 49 villagers returning from their fields. Then there was Qibya in the 1950s, Samoa in the 1960s, the villages of the Galilee in 1976, Sabra and Shatila in 1982, Kfar Qana in 1999, Wadi Ara in 2000 and the Jenin Refugee Camp in 2002. And in addition there are the numerous killings B'Tselem, Israel's leading human rights organization, keeps track of. There has never been an end of Israel's killings of Palestinians." The slaughter of 1,500 Lebanese civilians in Israel's indiscriminate bombardment of that country in 2006; the daily deaths in the Palestinian territories, the 120 in Gaza in a week -- including 63 on a single day -- in March 2008, one third of whom were children, form part of the same bloody thread that links Israel's shameful past with that of today. Israel will soon mark the 60th anniversary of its establishment. In so doing, Israelis and the Zionist supporters would do well to acknowledge the reasons why, for Palestinians and freedom-loving people throughout the world, there will be no cause to celebrate. Indeed, it will be a period of mourning and protest action; a time to recall the countless victims that lie in Israel's wake, as epitomized by the suffering inflicted on the inhabitants of Deir Yassin, the original site of which is ironically located just a stone's throw away from where the present day Holocaust memorial, Yad Vashem, was built. Yediot Aharonot, April 1972. This letter only came to light with Pa'el's consent in 1972. David Hirst ibid p. 251. David Hirst ibid and Jacques de Reynier, A Jèrusalem un Drapeau flottait sur la Ligne de Feu, Editions de la Baconnière, Neuchâtel, 150, p. 71-6 and Hirst ibid p. 252.